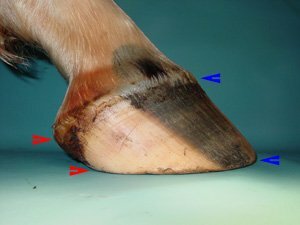 Determining hoof balance is a good first step for horse hoof trimming. A significant part of my assessment occurs prior to picking up the hoof. 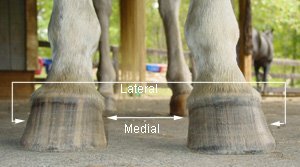 By looking at the foot this way, I am able to factor in the whole leg and the whole horse. Let me walk you through how I look at hoof balance. You will often see side to side balanced called medial/lateral balance. Medial means towards the middle, and lateral means towards the outside. I think of the center of the toe as 12:00, and I want that to be the longest part on the hoof. then compare 11:00 and 1:00 (red arrows). I want them to be a little bit shorter than 12:00, but roughly equal lengths. Next, I compare 10:00 and 2:00 (blue arrows). They also should be about equal lengths. Can you see that the foot is not balanced from side to side? As I look at and compare 3:00 to 9:00, the imbalance becomes more noticeable. Even without picking the hoof up, imbalances are evident. This works on bare or shod hooves. Should all feet be perfectly balanced? I have found that many horses never achieve what looks like balance. I plan on showing you the process I go through to decide what is normal for that horse and what will change. It involves trial and error and patience. I have found that as a general rule the hoof wall should be the longest at the toe and taper back towards the heels. If you have looked at enough hooves, you know that this is generally true. Most feet are longest at the toe and shortest at the heel, so this is not an earth shattering observation. If you want to see how the lamina taper back, take a quick look at this page. What is different is that I assess each section of hoof independently. When I look at the foot on the left, the front is screaming “Too Long!” The area from about 10:00 to 2:00 is over grown. The back section of the foot is fine. It might even be a little short, but clearly the front is what needs the most attention. There is a dish in the front wall (meaning it isn’t completely straight). Feet that have thinner walls will often do this when the wall is too long. Some feet have very thick walls, and they will not dish as easily. The hoof on the right shows a thick wall that is not dishing. The toe is disproportionately long but completely straight. My point, don’t rely on a dip in the wall to tell you that the wall is too long. Hoof balance is very much affected by a long toe. It places too much pressure on the back of the hoof. This causes a whole host of problems like under run heels, problems with tendons and ligaments and issues all the way up the leg. Even if you are a complete novice, almost anyone would notice that this does not look correct. The heels are way, way, way too high. The toe is long also, but the heels need the most attention. Once I take down the wall at the back of the foot (5:00 and 7:00), it will be easier to decide how much the toe needs work. Can you see how hoof balance is affected by a high heel? It is tipping the weight to the front of the hoof. At the end of 2007, I broke my leg badly. Because I was relying on crutches, I started thinking about hoof walls very differently. For each person using crutches, there is an optimum length that works best. Because people vary in height there is no one perfect length for everyone.At my perfect length, the crutches supported me and worked well. If I adjusted them longer, the whole dynamic changed. I had two choices for dealing with the added length. I could either move the bottom of the crutches further away from my body. Guess what that reminded me of? I thought of a flared hoof. The other choice was to cram the crutches further under my arms and lift my shoulders. Yes, I am a geek that thinks about feet far too much. This scenario made me think of tall feet. What impressed me the most was the fact that both situations involved the crutches being too long, yet the visual was vastly different. Not only did this look very different, it felt different too. Widening the crutches actually caused them to pinch my rib cage and it was hard to gain traction. The crutches wanted to slip away from me. Cramming the extra height under my arms caused rubs and made me lift my shoulders just like the coronary bulging up in some of the tall feet I see. The solution was the same for both scenarios; all I had to do was shorten the crutches. For me, this was very eye opening. The next big “Ah ha” moment for me came when I realized that one crutch could be too long and the other could be the correct length. They are independent structures. Thinking about this made me realize that one section of wall could be too long yet the very next section could be the perfect length. I needed to look at wall length section by section. I realized hoof balance can be affected by any section any where on the hoof. This foot is over grown. As her feet get longer, her foot becomes wider and larger at the bottom. If I think of the crutches when I look at her foot, it looks like one is a little longer on one side than the other. In my opinion, both sides are too long, but one more so. Her foot is still tapering back smoothly from the toe to the heel. Here I have evened up the side-to-side balance and shortened the walls all the way around. The trick is to shorten the walls without thinning them. That is why I only work the very bottom. This means that sometimes there is a little dishing, but it generally works itself out over a few trims. I don’t stress if it doesn’t and the horse is happy. I have not finished the heel in this picture. When I turn the foot over and smooth the heel area, this point would be smoothed out. The blue arrow at the heel shows where it is still too long. The lower red arrow indicates where I would taper it. This foot is also over grown, but it looks very different than the above foot. The reason is that with the previous foot any added length to the walls makes it wider. With a foot like this, any added length makes the foot taller. Yet, both are too long. He is relatively balanced, but starting to chip out here and there. Chipping is a form of self-trimming. The yellow arrow is where the foot has chipped out. What I actually wanted you to do is look at the hoof capsule in sections and notice that this one section is no longer as over grown. When I trim him, I will not have as much work to do here. I have balanced his feet up and tapered the wall back from the toe to the heels. Hoof balance can be a little elusive. I see many novice trimmers and owners working to make the hoof look the same from side to side. 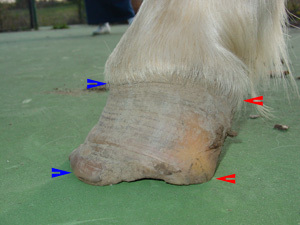 Many hooves are permanently asymmetrical. Hoof balance along with most other hoof distortions should not be forced to change. Always remember trimming is a process.